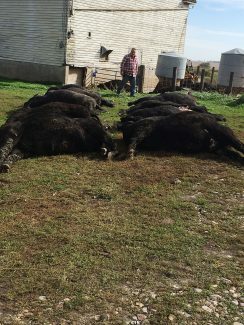 Joel and Marilyn Moser, of Alvord, Iowa, lost 87 beef cattle due to lead poisoning from a battery. Photo courtesy of the Mosers. Five months ago, while on a business trip to Florida, Iowa farmer Joel Moser got the call from his neighbor, who volunteered to do chores, that more than 100 of his cattle were exposed to tractor battery acid that got combined with the feed in the mixing wagon. He spent the following week trying, with little success, to keep his animals alive. 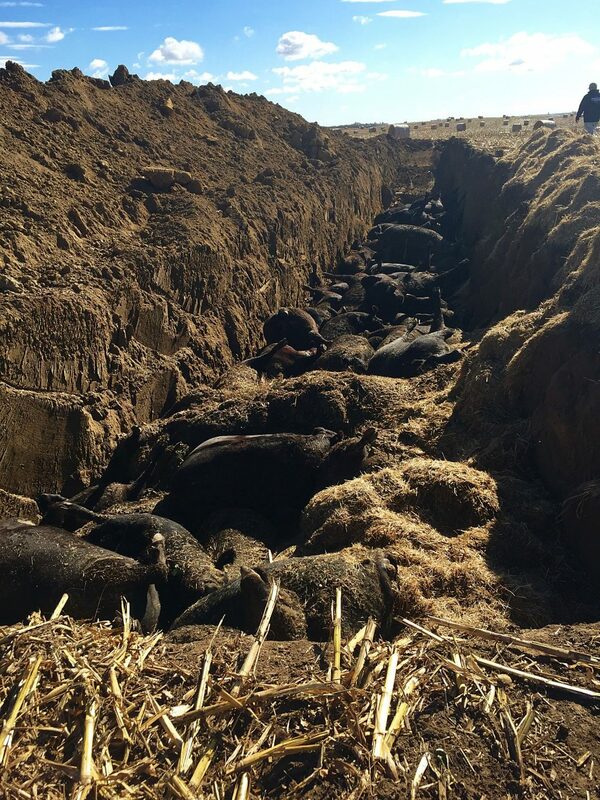 Eighty-seven of 102 head of cattle were buried in a ditch in his field. Neighbor Tristan Kuenzi performed chores for the Mosers, Kuenzi fed the battery to the cattle. The battery, which was from the Moser's tractor, is typically held in place with a grill, which had been off of the tractor for about four months, and the approximately 100 lb. battery was not otherwise secured. "We looked into it, and determined it a total accident. The sheriff department has no investigation against Tristan. It is a civil deal between the two," said Rick Voss, the investigator on the case. "Unless someone pops up and says John Doe did this with proof that they did, which I don't foresee happening, there is no reason to believe it wasn't an accident." Moser filed a lawsuit Jan. 17 against his neighbor after a series of events occurred following the deaths of the majority of his beef cattle, including being notified by his insurance company that there would be "no insurance coverage for the accidental loss, presumably because of one or more policy exclusions," according to Kuenzi's counterclaim, which was filed Feb. 24. The Mosers' surviving cattle will remain unsellable for another year-and-a-half. He has yet to replace the dead stock. When Tri-State Livestock News spoke with Moser in October, he said, "We don't know if the cattle are insured. We have an adjustor coming out and we're just hoping to get something, enough to survive. The paycheck is gone now. The equity is gone. There wasn't much anyway, and now there's a big hole. I'm not a big producer, it's a small cow-calf herd, 76 fat cattle, 76 calves in spring. That was everything. That would have been our paycheck." 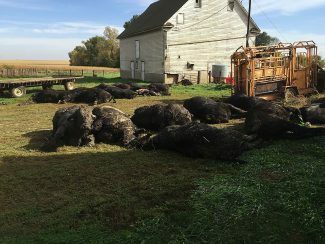 Jeff W. Wright, a partner at Heidman Law Firm, P.L.L.C., the firm representing the Mosers, said, "As the public Petition states, our clients, Joel and Marilyn Moser, have suffered a significant and tragic loss due to events that caused lead poisoning of their livestock. Therefore, as the petition outlines, our law firm is assisting Joel and Marilyn pursue a judgment for such damages from the Lyon County District Court. Our law firm is not able to comment further at this time." The defendant and his law firm did not return communication attempts. – Plaintiff Joel Moser used the loader tractor for the same chores and others for the four months with the front grill removed from the tractor without any issue even at various degrees of stopping, jolting, incline, and decline. – The loader tractor's battery cables had not been damaged when the battery was disconnected. – Defendant, negligently or intentionally, scooped the battery with the loader and placed it into the mixer wagon with the TMR for the cattle. – The loader tractor continues to operate without a battery after it has been started, but it will not start without a battery properly connected. – Loading the TMR mixture requires checking the loading path upon approach for items such as the tires that hold the tarp on top of the silage piles to verify that no foreign objects are loaded and placed into the mixing wagon. – Defendant Tristan Kuenzi then attempted to start the loader tractor he had used the previous day to load the TMR, but it would not start without a battery. 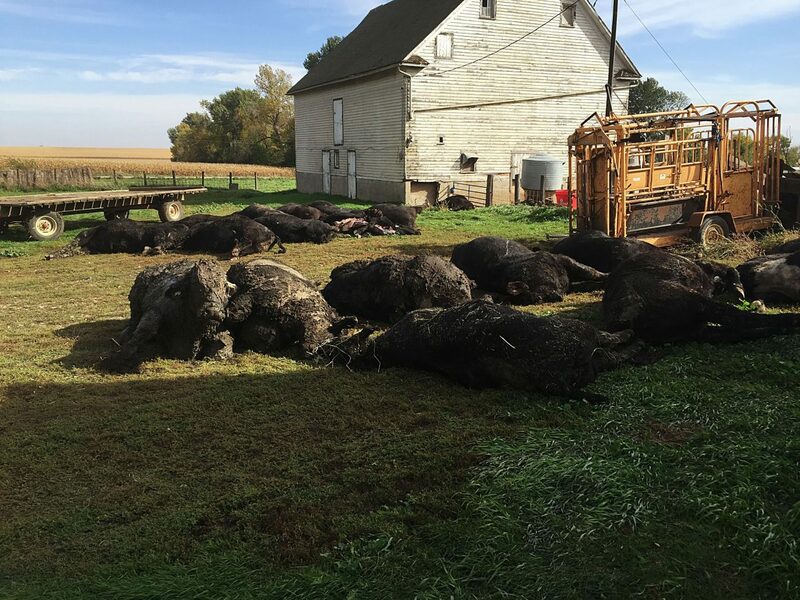 – Plaintiff Joel Moser expressed his concern that Defendant Tristan Kuenzi's observation was wrong because typically the cattle graze on the feed until around noon. 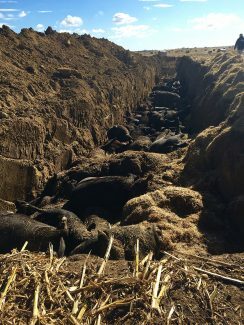 – Plaintiff Joel Moser noticed that in addition to Defendant Tristan Kuenzi failing to remove the poisonous feed from the bunks on the morning of October 9, 2016, pieces of plastic and parts from the battery still remained in the feed bunks. – Known to Moser, the tractor had been missing its grill for months, which Moser either removed or chose not to re-install. In addition to other functions, the tractor grill prevented the tractor's starter battery from falling off the tractor, as it was only secured by the battery cables attached to the posts on the battery and otherwise sat loose in a battery tray . . .
– While Moser had operated the tractor in that condition for months, Kuenzi had never before used the tractor, never participated in the maintenance or repair of the tractor, and was generally unaware of the danger posed by the missing grill. – As Kuenzi has his own regular employment and working hours, Keunzi returned to Moser's to haul feed to the cattle while it was still dark on the early morning of October 9, 2016. 9. After the sun rose on the morning of October 9, 2016, Kuenzi became aware that battery pieces, and more particularly, plastic battery casing, were visible in the feed bunks of Moser's cattle yard. – Kuenzi immediately contacted Moser and explained what Kuenzi had observed. – Upon being contacted by Kuenzi, Moser immediately knew what had likely happened, because Moser was fully aware of the condition of the tractor and of the risks that it posed. – Subsequently, and again upon information and belief, Moser concocted a story that his cattle were intentionally poisoned by Kuenzi and/or an unknown suspect. – Since a few days after October 9, 2016, and continuing up to present, Moser has communicated to one or more individuals false statements that Kuenzi intentionally poisoned Moser's cattle. In at least one version of Moser's story, Moser alleged in communications to a mutual acquaintance of the parties, a story to the effect that Kuenzi poisoned the cattle due to a vendetta Kuenzi has against Moser because Kuenzi was not included as a beneficiary in Kuenzi's father-in-law's last will and testament, and Moser and Kuenzi's father-in-law are neighbors. – Moser's communications are slanderous per se in that they falsely implicate that Kuenzi committed an indictable crime. Moser hopes for some closure from the incident. "I've got all the neighbors telling me he hired a lawyer, and he never showed his face, so what do you do?" Moser said. "I wonder what the heck happened and what he's hiding? We need to get this behind us and move on. He needs to admit his negligence and we can move on." The court date is expected to be in early 2018.